2018 Kennedy Center honorees, front row from left, Wayne Shorter, Cher, Reba McEntire and Philip Glass; back row from left, the co-creators of "Hamilton," Thomas Kail, Lin-Manuel Miranda, Andy Blankenbuehler and Alex Lacamoire. Last year's Kennedy Center Honors ceremony was almost overshadowed by controversy surrounding the sitting president. This year's event took place in the shadow of the death of a former commander in chief. Within days of that White House visit, Estefan's tour bus was in a serious accident that left her nearly paralyzed, and Bush called her in the hospital, she said. The Trumps skipped last year's ceremony after several of the honorees, most notably television producer Norman Lear, threatened to boycott if he attended. This year, nobody issued that kind of overt threat, but the Trumps still announced three weeks ago that they wouldn't attend. This year's honorees for lifetime achievements in the arts were Cher, composer Philip Glass, country music legend Reba McEntire and jazz icon Wayne Shorter. An unprecedented special award went to the co-creators of Hamilton for their genre-bending musical. 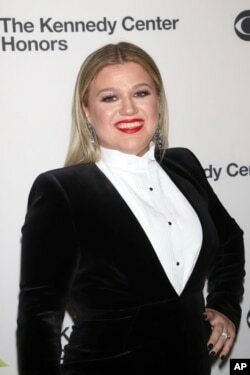 Kelly Clarkson attends the 41st Annual Kennedy Center Honors at The Kennedy Center in Washington, Dec. 2, 2018. McEntire was introduced by music star Kelly Clarkson, who performed McEntire's hit song Fa​ncy. This year's event contained a break from tradition by honoring an actual contemporary work of art, the blockbuster musical Hamilton, in addition to lifetime achievement awards for late-career artists. Writer and actor Miranda, director Thomas Kail, choreographer Andy Blankenbuehler and music director Alex Lacamoire were honored as "trailblazing creators of a transformative work that defies category." Cyndi Lauper attends the 41st Annual Kennedy Center Honors at The Kennedy Center in Washington, Dec. 2, 2018. The evening ended with Cyndi Lauper, a longtime friend of Cher's, performing If I Could Turn Back Time.